Some of you have asked what scale we will make our models in. This is an excellent question, and while we haven’t settled on the exact size yet we felt it was appropriate to explain a bit about scale when it comes to models. This is probably the most confusing part when understanding models. Simply put, scale is the ratio of the real object to the model, annotated as 1:64 or 1/64. A model in scale 1:64 means that for every 64 feet on the real object equals 1 foot on the model. The lower the denominator in the ratio the larger the model. For example a 1:64 model is larger than a 1:87 model which in turn is larger than a 1:160 model. The graphic below depicts the same model in different scales. 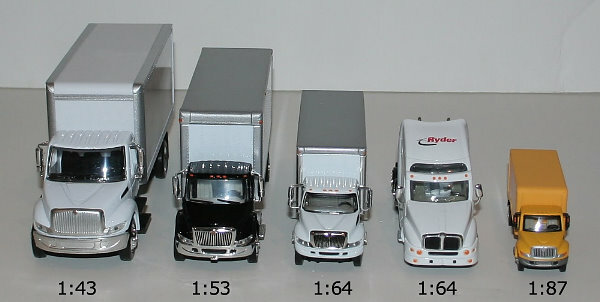 There is an exception however, the 2nd model from the right is a different truck and is used to show the comparison of two different trucks in the same scale. This table outlines some common scales and their uses. Those in red are popular with collectors and modelers. What scale should be used? Lets take some actual attraction building sizes and see what scale they fit best into. We will calculate in both directions so you can understand how the calculations work both ways. Before going further, let me just say that the imperial method for measurements is a complete nightmare!! We much prefer the metric system, but we digress. The table below has some popular attractions and modes of transportation and their associated sizes in real life. We’ll fill in the table as we move along. So what would these items be like if we made them in 1:87, the most popular model railroad scale in the United States. WOW! The horizons model would be over 4 feet long and the 20k Lagoon would be over 5 feet. Clearly this scale will not work well for most of the models. Note that for a Jungle Cruise boat, this is a really nice size at 3.5 x 1.25 inches; we could even go bigger with that model. Step 4 – Z Scale – What happens if we go smaller? Ok now we will scale down to Z scale, or 1:200. Z scale is the smallest (well there is one smaller) of model railroads and is popular in Europe. We can see that now the Liberty Bell and the Monorail are a decent size. The monorail may have to come down in size a bit, but we have a good working point. The Jungle Cruise Boat is now loosing detail as it gets smaller, and the buildings are still way too big. Now moving a bit smaller we can see that we now come across sizes that are respectable for the buildings. At 1:600 the horizons building would be 8×4 inches, a good size for detail. However we may even have to go smaller if we wish to include the pathways and greenery around the building. Remember the dimensions below are only the actual buildings and not the surrounding landscape. A 1:600 building model of Horizons could swell to over 1 foot in size after you add landscaping. But this gives us a good start. Also note at 1:400 and 1:600 the usefulness of these scales for the other objects is no longer useful. no one wants a Jungle Cruise boat that is 1/5th of an inch wide! Flip it and Reverse it! What about if we know exactly what dimensions we want our model to be? But would like to calculate the scale? That is an easy reverse calculation. Lets assume that with landscaping our Horizons model will be about 12.4 inches x 8 inches. If we take the actual dimensions in inches, and divide that by the model size, we will get the scale. In this example, imagine a 8 x 4 inches horizons building, surrounded by about 2 inches of landscaping on all sides. 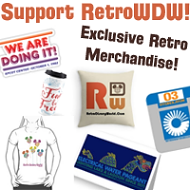 We’ve explained a lot here, and we hope you’ve been able to follow along. What is your thought on scale? What size models would you like to see?